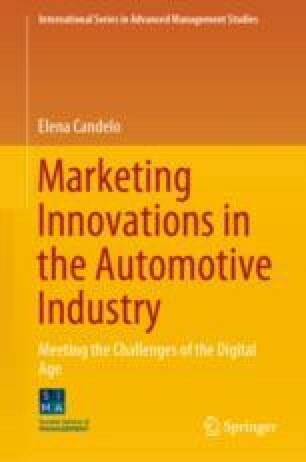 On the threshold of the new millennium, certain carmakers made an important initial reaction to the advances in the digital economy. They started to prepare themselves for their future as “transportation solutions providers”, and no longer just vehicle manufacturers. The “day of reckoning” came about in November 1999 when both Ford and GM announced their plan to each launch their own value chain based on digital technology. However, a new breaking point in the marketing of automotive companies was approaching. It was driven by new digital technologies that enormously expand the reach, speed, convenience, and efficiency of platforms. It derived from the fact that the system of relationships rendered possible by the platforms changed and damaged the traditional value chain in the automotive industry. The new technologies facilitated communication and the exchange of data between participants in the network. The more a company attracted new participants to the platform (owners, providers, producers and consumers), the greater the network became and the more transactions between demand and supply increased. The larger the scale, the more value it generates. The capacity of certain companies to take advantage of the development of the platforms soon posed a threat for incumbents. New competitors quickly entered the market, proposing a new kind of “crowd-based public-private partnership”, including Uber, Lyft and BlaBlaCar. The emergence of Tesla is also a clear example of a threat for incumbents. In recent years, digital marketing in the automotive industry has made significant advances, but it is still behind compared to other major sectors.